Six months ago esophago-gastrectomy for adenocarcinoma of the gastric curve. Histology: adenocarcinoma, signet-ring cell type at follow-up the patient has difficulty breathing. MRI: Presence of some retroperitoneal lymph nodes and a node of about 14 mm at the para-aortic level. Bilateral pleural effusions evident on the right. Poor groundwater intra-abdominal fluid, peri-hepatic. Presence of many epithelial malignant tumor cells isolated, with eccentric nucleus and large cytoplasmic vacuoles, mixed with rare mesothelial cells, some lymphocytes and granulocytes. Positive for malignancy. 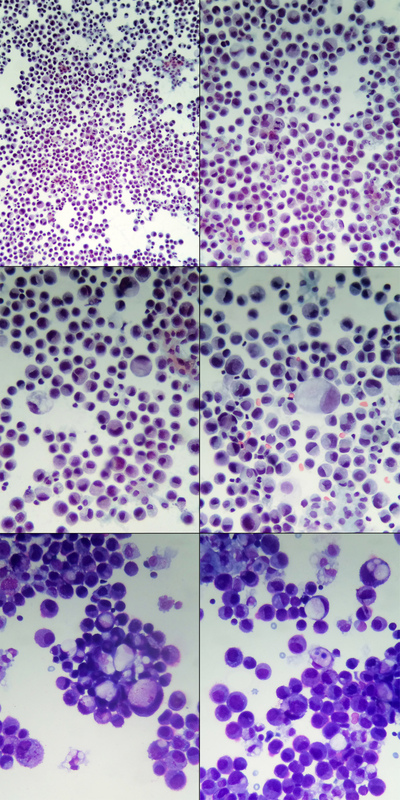 Cytologic Finding consistent with localization of adenocarcinoma of the stomach, signet-ring type.